You can charge your device faster using the fast wireless charging feature. 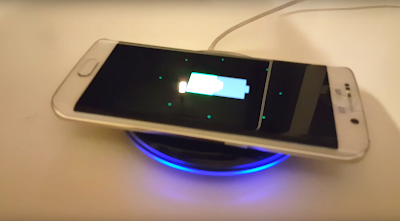 To use Galaxy S 7 features, you must use a charger and components that support the fast wireless charging feature. A fan inside the charger may produce noise during fast wireless charging. To reduce the fan noise, you must deactivate the SamsungGalaxy S7 Fast wireless charging feature. The on/off option will be added in your device’s settings menu when you first place it on the charger. Place the centre of the device’s back on the centre of the wireless charger. You can check the remaining charging time on the screen. The actual remaining time may vary depending on the charging conditions. After fully charging, disconnect the Samsung Galaxy S7 device from the wireless charger. battery may not charge properly.